The European Network on Religion and Belief will be convening a workshop on religion / belief and conflict resolution. Several peace processes have recently demonstrated the need to inclusively engage religious leaders and faith-based actors with a focus on inclusion of all — including minorities and local communities — in official negotiations to reach political settlement to conflicts. The presence of religion in societies is a permanent reality that has far-reaching impact and influence. Whilst there exists some concerns about religion as a cause of conflicts, the reality is often much more complex with other underlining factors and the conflation of issues. Religions can play a complementary social and political role. Religious actors also shoulder responsibilities to help avert conflicts whether inter-religious, armed conflicts, hostilities and in post-war realities such as rebuilding society and fostering harmony and reconciliation between communities. This is particularly the case for conflicts in which religious dynamics have co-shaped and driven the course of conflict and contributed towards its imperviousness to resolution. 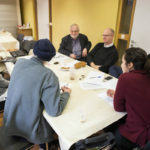 In such conflicts, religious actors and communities often feel that they have interests at stake in political negotiations related to the peace processes, and, if excluded, may subsequently disrupt and spoil official negotiations. It is against this backdrop that ENORB is convening this timely workshop, engaging academics and practitioners alike to share and exchange diverse experiences in an inclusive discussion. The workshop aims to inform future peace negotiations to encourage more thoughtful, effective engagement of religious leaders and faith based-actors. The workshop will include facilitated conversations on the roles of religious actors in formal and informal peace processes, with an emphasis on the vital input of local communities and religious/ethnic minorities. 10:30 Introduction on Religion and Conflict Resolution — Salpy Eskidjan, WCC Religious Track.